I'm really rubbish at growing things in the garden (I actually can't even keep house plants alive truth be told) apart from rocket. I'm brilliant at growing rocket. Last year one small pack of seeds, sown by the kids, produced an abundant harvest. This year, with no effort on my part, a magnificent crop of rocket has taken over an entire flower bed. It's incredible. So what to do with an abundance of rocket? It pains me to see something which I (sort of) grew with my own bare hands go to waste. So I made this rocket pesto using goats cheese instead of parmesan. It's delicious stirred through pasta, drizzled over roast chicken or stirred through new potatoes to make a quick potato salad with a kick. Rocket pesto a great way to use and store a glut of rocket - or one of those bags from the supermarket which is just past it's best. It keeps in a jar in a fridge with a layer of olive oil over it for up to two weeks, or you can freeze rocket pesto in an ice cube tray and defrost cubes when required. Goats cheese goes really well with rocket and gives a lovely flavour, but you can use parmesan or any hard cheese you have in the fridge. Cashew nuts give a lovely creamy texture but walnuts or pine nuts can be used instead. 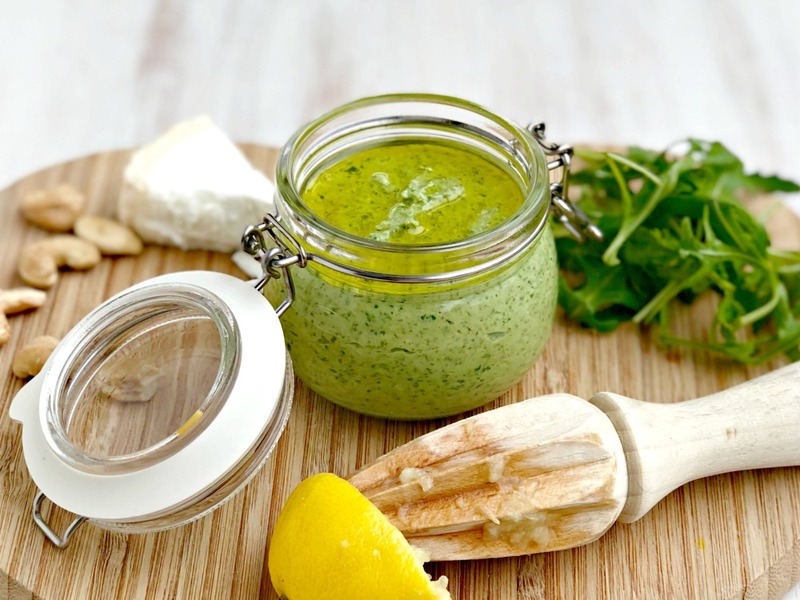 Rocket pesto has quite a strong flavour so you may want to add a little creme fraise or soft cheese to serve. Put the cashews into a food processor and blitz to make a breadcrumb like texture. Add the goats cheese and blitz again. Put the rocket and lemon juice into the food processor and blitz to make a paste. You may have to stop it and scrape the sides of the bowl a couple of times. Finally, drizzle the olive oil into the mixture in the food processor gradually and slowly while its mixing until you have a pesto-like consistency. Scrape out the rocket pesto into a clean jar and pour a little olive oil over the top of the pesto to keep the colour. Will keep in the fridge for up to two weeks in an airtight jar with oil on top (just replace oil after use). See notes about freezing.